Baye's Managerial Economics and Business Strategy is one of the best-selling managerial economics textbooks. It is the first textbook to blend tools from intermediate microeconomics, game theory, and industrial organization for a managerial economics text. Baye is known for its balanced coverage of traditional and modern topics, and the fourth edition continues to offer the diverse managerial economics marketplace a flexible and up-to-date textbook. Baye offers coverage of frontier research in his new chapter on advanced topics. 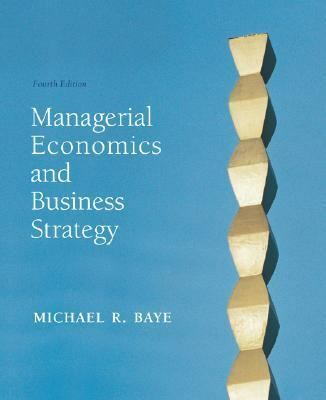 The Fourth Edition also offers completely new problem material, data, and much more.Baye, Michael is the author of 'Managerial Economics and Business Strategy W/Data Disk' with ISBN 9780072818635 and ISBN 0072818638.